This is a knot from the Pict tradition of ancient Scotland. It is a one-line infinity knot that creates four hearts. The simplicity of this design allows a person to ponder upon that which connects one generation to another: the Truth of the four Gospels, the cycle of the four seasons of nature, the four aspects of a person (physical, intellectual, emotional, spiritual). It is a 5 inch circle. 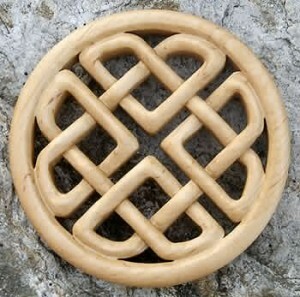 The knot is carved on both sides. It is made of White Birch. It has a thin nylon thread attached so that it can be hung on a wall or in a window. 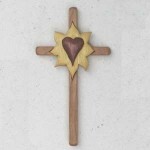 The crosses that I design and offer are not pieces of jewelry, but a true reflection of your personal faith and spirituality. I can accomplish this by communicating with you about what you are looking for. 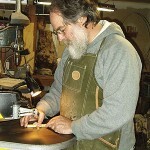 May be custom-designed to your needs. 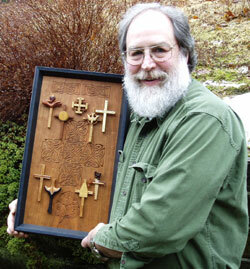 During 25 years of ministry, I have designed wooden crosses that are tangible expressions of a deeper spirituality. The cross of Christ is always at the center of my designs just as the Promise of the Resurrection is at the center of the Christian faith. 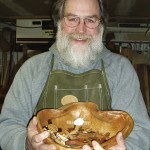 By creatively combining particular symbols and images with specially selected woods, I make each cross into a distinctive statement of faith.